BADULF (BADOUR, BADOLF), an Abbot of Ainay Abbey, near Lyons in present-day France. He reposed circa 850. Nothing else is known about him. BERTULF, as the son of a pagan noble St. Bertulf was raised as a pagan. However, the holy live of his close relative, St. Arnulf of Metz (10th July), so inspired him that he became a Christian. In 620 he received monastic tonsured at Luxeuil Abbey. Soon after Abbot St. Attalas (10th March) of Bobbio visited Luxeuil, and St. Bertulf and Attal became friends, and with a blessing from Abbot Eustace of Luxeuil, St. Bertulf left Luxeuil, and the community at Bobbio. Following the repose of St. Attala, 627, Bertulf was elected to be the successor of St. Attala as Abbot of Bobbio. St. Bertulf reposed 640. CALMINIUS (CALMILIUS), (Sixth or Seventh Century), the founder of Mozac Abbey, in Puy-de-Dôme; Laguenne Abbey (near Tulle, Corrèze), and the abbey of Monastier-Saint-Chaffre. His widow, St. Namadia (vide infra), received monastic tonsure at Marsat in Puy-de-Dôme, a dependency of Mozac, upon St. Calminius’ repose. The relics of both these saints are enshrined in the abbey church at Mozac. CREDAN, (Eighth Century), St. Credan served as Abbot of Evesham in Worcestershire, England during the reign of King Offa of Mercia. Though the details of his life are lost to the passage of time, he is remembered in various calendars and menologies. DONATUS, a hierodeacon from Orléans who lived as a hermit on Mt. Jura near Sisteron in Provence, reposing circa 535. ELAPHIUS (ELAPHE), the 17th Bishop of Châlons-sur-Marne in Gaul who was sent as an envoy to Spain, but reposed whilst travelling there. GUENNINUS, a seventh century Bishop of Vannes in Brittany whose relics are enshrined in St. Peter's Cathedral, Vannes (Cathédrale Saint-Pierre de Vannes). JULIUS, (Late Second Century), a Roman senator who was scourged to death for being a Christian. 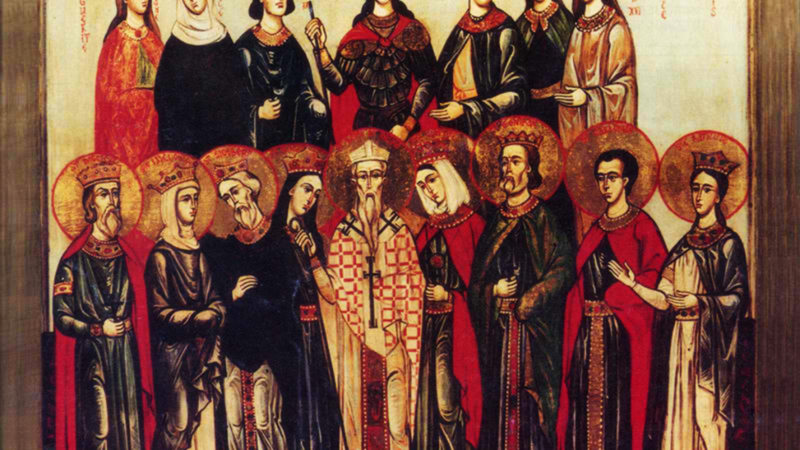 LEOVIGILD and CHRISTOPHER, two members of the group of forty-eight martyred in Cordoba under Abd ar-Rahman II between 851 and 859, and commonly known as the Martyrs of Cordoba. St. Leovigild was a priest-monk in Cordoba, and St. Christopher a monk at the monastery of St. Martin de La Rojana near Cordoba. They were both martyred by decapitation, 852. MARIANUS, a hermit in the forest of Entraigues in Berry in Gaul who reposed circa 515. St. Gregory of Tours (17th November) was the author of St. Marianus’ Life. MARINUS, Abbot-Bishop of the monastery of St. Peter in Besalu, Catalonia, Spain. St. Marinus reposed circa 800. MOCHTA (MOCHTEUS), St. Mochta, originally from either Scotland or England, went to Ireland where he became the founding Abbot-Bishop of Louth, Co. Louth. Many sources state St. Mochta flourished during the sixth century, though most assert he was consecrated Bishop by St. Patrick (17th March), which would place him in the fifth century. NAMADIA, the wife of St. Calminius (vide supra) who received monastic tonsure at Marsat, a dependency of Mozac, in Puy-de-Dôme, upon St. Calminius’ repose. The relics of both these saints are enshrined in the abbey church at Mozac. RUFINUS, (Date Unknown), there is no information extant on the life of St. Rufinus, who is listed in the Roman Martyrology as a Confessor. He could have been a priest, and has been venerated in Mantua in Lombardy from time immemorial. SEBALDUS of NUREMBERG (SINIBALD, SEBALD), There are no certain details of this saint’s life known to us. It is likely he was a Frank, who after a pilgrimage to Rome, joined St. Willibald (7th July) in his evangelisation of the Germans. His work seemed to have centred around the area of Nuremberg, of which city he is the patron saint. St. Sebaldus most probably reposed circa 770.